It’s so easy to find a toy my two-year-old son wants to bring home. If it were up to him, we’d own all the toys. However, because we don’t have all the money or all the space, that’s not really an option. Sorry, dude. What’s not so easy is deciding which toys actually are worth the money and space in your house. 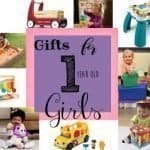 With so many gift options to choose from for birthdays, Christmas, Hanukkah, and other special occasions, it’s easy to spend hours and hours looking for the best toys. But really, who has time for that? 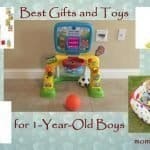 Therefore, to make your life just a little easier, we present 25 gifts your little man will love. They’ll bring him hours of fun while also helping him develop the important physical, mental, social, imaginative, and creative skills that are so critical for this age. As toddlers reach the age of two, they are just gaining the desire and ability to be creative. The following products will foster their interest, from artistic creation to musical expression and more. 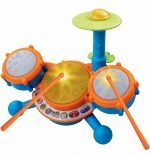 This cute little drum set comes with three drum pads and a cymbal, which all make sounds and light up when hit. You can even change the sounds from drum to silly sounds, animal noises, or DJ sounds. 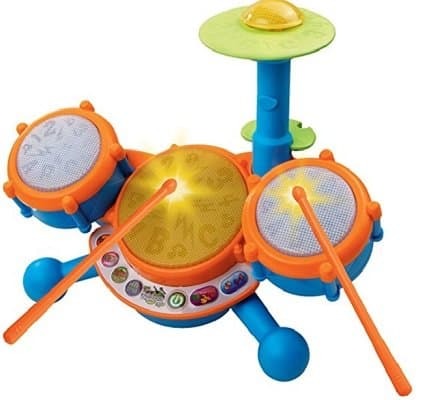 Your child can play with his hands or use the drum sticks to feel like a real rock star. There are nine songs for your child to play along with, or he can pause the background music and play his own awesome drum solo! The set has four playing modes. In Free Style, your child can play along with a song. For learning letters, the Alphabeats mode will light up one of the drum pads, and hitting the right one will let your child hear a letter, letter sound, or word. The Numbers Jams does the same thing, only with the numbers 1 through 30 and back down. Finally, the Follow Me mode works on your 2-year-old’s memory by playing a sequence he has to remember and copy. Again the lights lead the way, and a new one is added each time your child gets it right. The set is small–tabletop size–which makes it easy to take with you when you travel. And best yet, there’s volume control! Hallelujah. This easel is a chalkboard on one side and a magnetic whiteboard on the other. 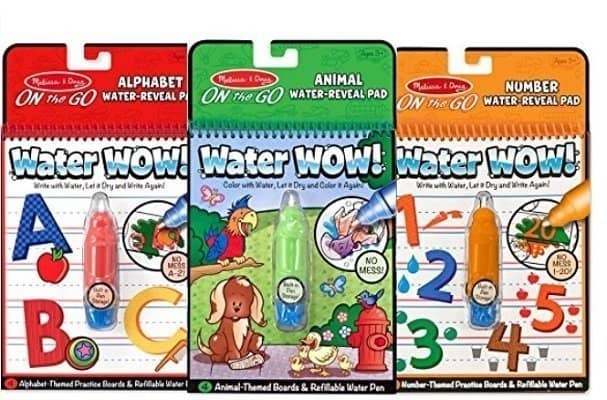 It comes with 77 foam magnetic letters, numbers, and signs for your child to use. Large clips on both sides of the easel can hold paper for coloring or painting, and a deep tray underneath is great for holding all of your little artist’s supplies. 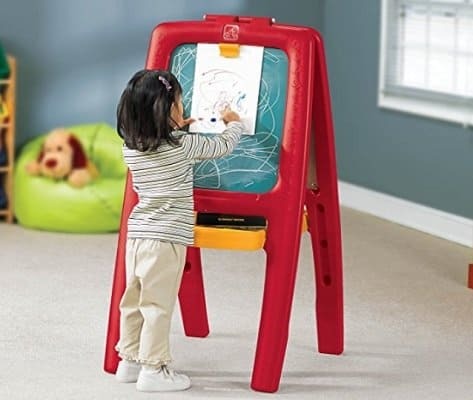 With two sides to work on, this easel is perfect for play dates and sibling time. (Hey, your kids might actually play well together with this!) When it’s not being used, the easel can fold up for easy, out-of-the-way storage. I still remember when a set of these arrived in the mail from my mother-in-law for my then-two-year-old daughter. It was an absolute lifesaver–the only way I was able to make dinner in peace that night. My daughter thought they were magic! And the magic of them still hasn’t worn off for her, nearly two years later. Each book is a collection of black-and-white drawings. When your child colors on them with the refillable water pen, the colors (and a few hidden images) appear. Then, when the water dries, the color fades away again. Your child can use them over and over again! This particular set features animals, numbers, and letters, but there are all kinds of designs available. Plus the pads are small and light, making them great for cars, airplanes, the doctor’s office, church, or anywhere you want your kids to be quiet for awhile. There’s even a place on the front to hold the water pen so it won’t get lost. This is a simple, easy way to introduce your little one to the world of artistic creation. This set comes with 10 colorful pictures with several holes in them that your child can fill in with large, plastic buttons. All they have to do is match the color of the hole with a button of the same color and snap it in. There are 46 colorful buttons and a storage tray to hold them in so they don’t get lost. The storage tray also acts as a holder for each of the thick cardboard pictures, keeping it in place as your child works. 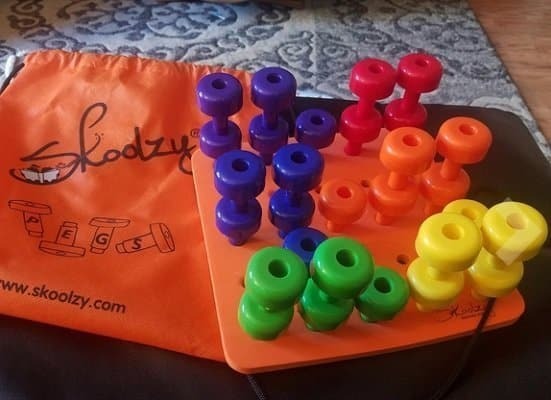 In addition to teaching those all-important skills of hand-eye coordination, color matching, and fine motor function, this set can also foster your child’s creativity as he breaks the “rules” and experiments with different colors in different holes. What little boy doesn’t love dirt? I know mine does! Only we moms don’t like having dirt all over our homes, which are already so hard to keep clean. I used to think sand only belongs at the beach. 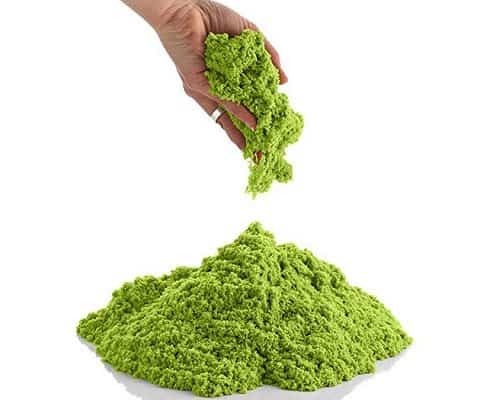 Enter kinetic sand! It has all the dirty, sandy qualities of, well, sand, but it brushes right off of your hands and clothes. It only sticks to itself! It’s also non-toxic and doesn’t dry out over time. Your child can use it with sand molds, and it will hold its shape well. He can also stage a dinosaur dig or create a construction site with digger trucks. The possibilities are endless. CoolSand comes in a variety of colors, some of which are glittery.This option comes with an inflatable sandbox and two sand castle molds. This 10-piece musical instrument set includes maracas, a clacker, mini cymbals, a tambourine, a triangle, and tone blocks. There’s no shortage of fun sounds your child can make! As he plays along with his favorite music or creates his own beat, he’ll learn more about rhythm. By practicing playing loudly and softly, he can experience dynamics. 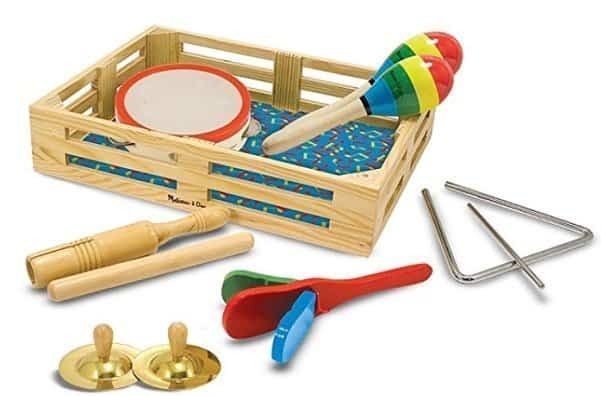 A set of musical instruments is a great toy for teaching social interaction and group play. Every member of the family, or a group of friends for a play date, can choose an instrument and play together. Your child can even pretend he’s a conductor! This set of well-made music makers will last your child for years. Plus everything can be stored in the small wooden crate for easy clean-up. If only it were possible to bottle the energy of a two-year-old boy. Think of the money people would pay for that! But until that day comes, here are some fun outlets for your little one’s energy. Every toddler mom needs a slide in her house. Because sometimes you want your kids to play outside, but you just don’t feel like taking them to the park. Or maybe you can’t. 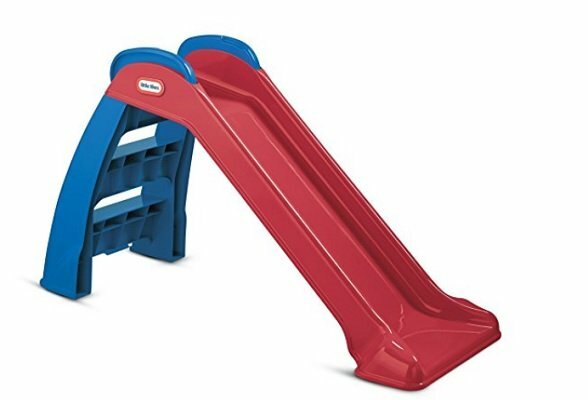 This slide from Little Tikes is great for outdoor or indoor use. You can even have the slide end in a kiddie pool or a mini ball pit. There are so many possibilities (and your child will think of them all, I’m sure). Stretching to three feet long, this little slide easily collapses for storage or relocation. It can hold children up to 60 pounds, so your little one can use it for years to come! With the growing concerns about children becoming less and less active, this toy is perfect for keeping your kid active no matter what the temperature is outside. 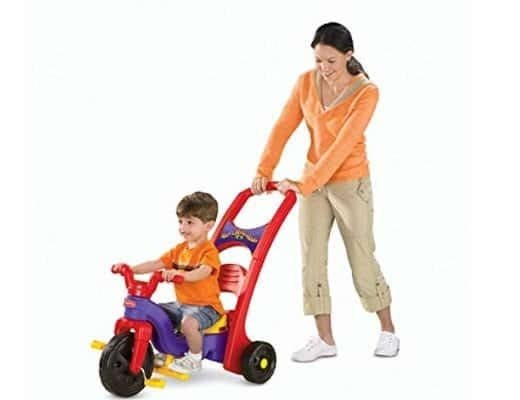 This versatile tricycle can be used in three different ways–as a rocker, a push toy, or a regular trike pedaled by your child. My son loves to rock on his inside the house, and when we go outside I can teach him how to pedal and steer as I help push. Pretty soon he’ll be able to ride it on his own, just like his older sister learned to do. The trike’s big foot pedals are great for smaller, first-time riders, and the large, wide wheels provide a lot of stability. As with a real bike, the seat is adjustable to fit your growing child. Everything on this bike is really easy to adjust, with no tools needed. Your kid will love riding around and feeling like a big boy. And as an added bonus, he’ll be strengthening his leg muscles and developing important gross motor skills at the same time. Win-win. As someone who lives in the mountains, where it snows a lot, I always love an active toy that can be used both indoors and outdoors. Otherwise winter can feel so long! 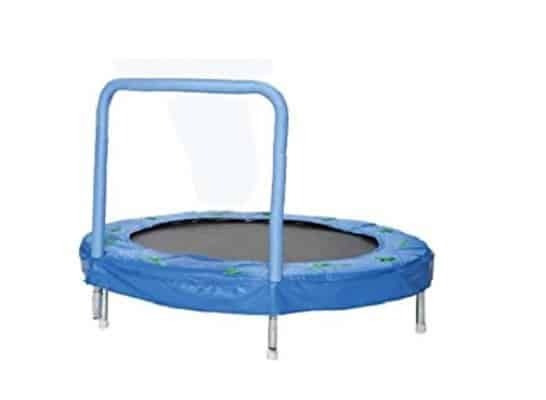 This miniature kid’s trampoline is perfect for that as well as for those of us with backyards and budgets that are a bit too small for the real thing. The handle is padded for comfort and can be adjusted to two different heights–22″ and 25″. It can even be removed completely. The trampoline itself stands 9″ off the ground and can hold up to 100 pounds. It has six legs for extra stability and galvanized springs for a better bounce. Plus the frame is rust-resistant. Your child will love the cute frog pattern on the padding around the edge. He may even pretend he’s a frog himself! As he does, he’ll gain greater coordination and balance, strengthen his leg muscles, and get some of his energy out! 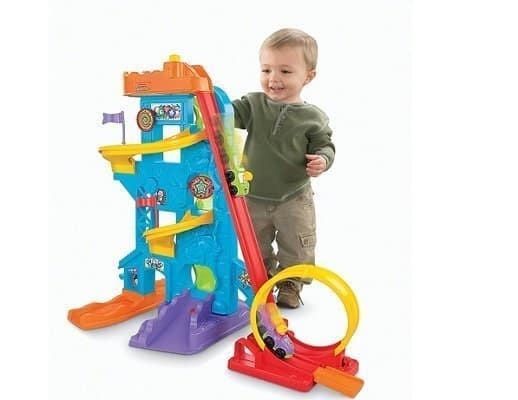 This 10-foot long mini roller coaster is every child’s dream toy. I mean, really. It has two fun hills and no line to wait in! 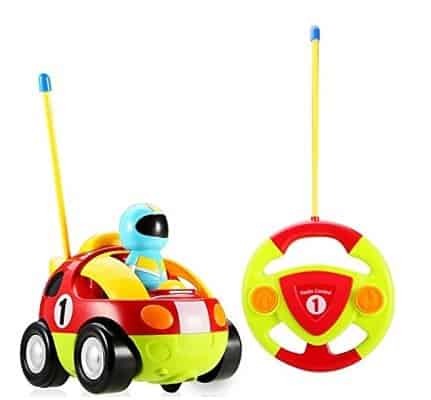 Designed for indoor or outdoor use, the car can be used on or off the track, and the track can be used for balls, toy cars, or anything else your child wants to watch roll down. At the top of the coaster is a recessed wheel well to keep the car steady as your child climbs in. A handle at the front and foot rests on the sides keep him safe as he coasts down. There are non-slip steps attached to the top of the track, and you don’t need any tools to put it together. 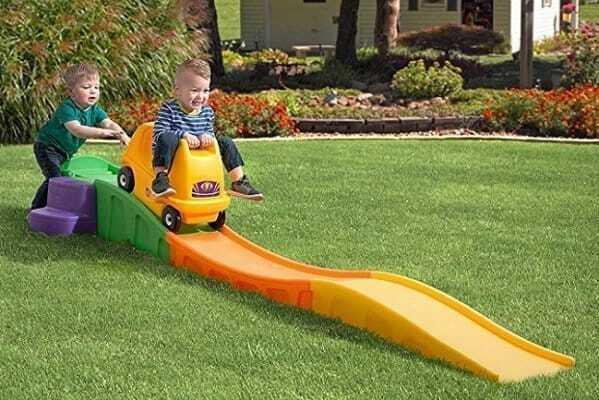 Your kid will love having his very own roller coaster to ride whenever he pleases. And you’ll enjoy a little peace (though maybe not very much quiet) as he plays happily by himself for hours. This water table really is like a little waterpark. It comes with five water-squirting character balls that get to do the “rides.” They can be dropped down the spiral in the middle of the table or ride the ferris wheel around and around. Your child can use the water cup to pour water into the funnel to make the mini water wheel spin. He can also create waves by turning the green spinner. And, of course, there’s always the simple fun of just splashing around! The table is 31.5″ tall and holds seven gallons of water. It’s a great way for a two-year-old to play with water unsupervised, as a kiddie pool may still be too dangerous for solitary playtime. 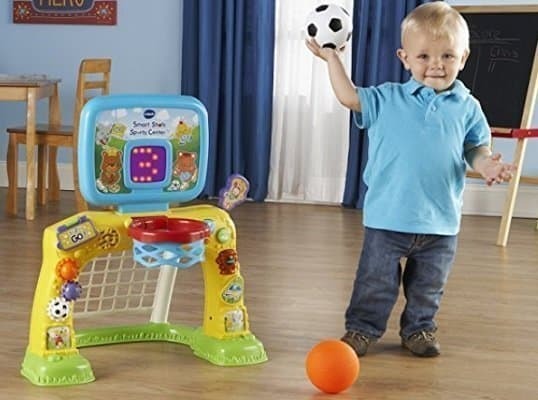 Consisting of both a soccer net and a basketball hoop, with their respective balls, this toy has a light-up scoreboard that counts your child’s successes and cheers him on. Buttons teach shapes, numbers, and letters, as well as play more than 50 sounds, phrases, and songs. Your child will love dunking the basketball into the hoop or kicking the soccer ball into the net. And in addition to the academic things he’ll learn from the auditory parts, he’ll gain important gross motor skills, such as balance and hand-eye coordination. Assembly is fast and easy, and the whole center doesn’t take up too much space. There is also a place to store the balls when not in use. And, as we parents love to hear when it comes to sound-making toys, there are two volume levels and it will actually turn itself off after a minute or two of inactivity. Remote-control cars are the kind of toy two-year-olds love but are never actually able to use–until now. This electric car only has two buttons to make it function–one to go forward and another to go in reverse and to the left–making it perfect for younger children. As your child practices making the car go, his fine motor skills, finger strength, and flexibility will improve. He can also remove the race car driver from the car to play with separately, allowing for further imaginative play. And as is necessary for any toy exposed to toddlers, this little car is very durable. It also plays music, flashes its headlights, and makes honking sounds as different buttons are pushed. What more could you need in a toy car? Toddlers are like little sponges; they absorb so much more than we realize! Because they learn through play, it’s so important to provide them with toys that teach them more about themselves and the world around them. 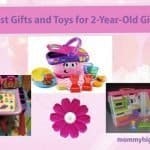 The following gifts will help them learn motor skills; color, letter, and number recognition; spatial awareness; and more. Toddlers love to sort things, which is good, because it helps them to learn! 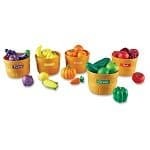 In particular, this set teaches color recognition and–with your help–can also teach counting. 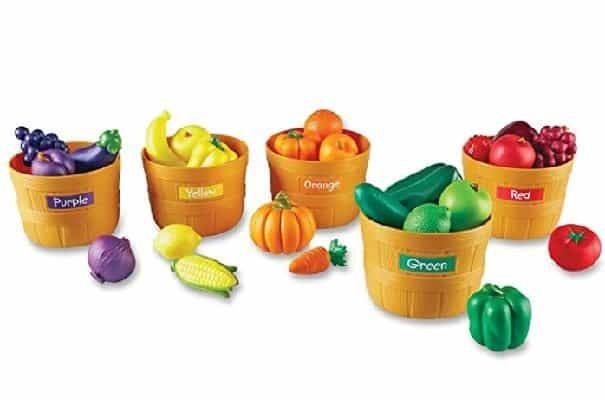 The package comes with five barrels, each with its own color label, as well as five fruits and vegetables in each color. Your child can sort the foods into the appropriate barrels and count them as he goes. 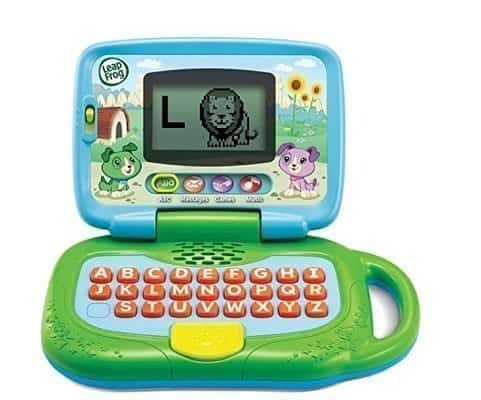 The cleverly named Leaptop gives kids a toy that resembles Mom and Dad’s laptop but is much more limited and directive. There are four modes–ABCs, Messages, Games, and Music. Your child can send and receive pretend messages; learn letters, phonics, and corresponding vocabulary; and play 16 unique songs. You can even customize the Leaptop with your child’s name, and it will teach him how to spell it! The device also folds like a real laptop and includes a handle for easy transportation. 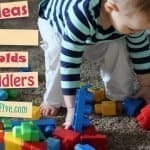 Building blocks are a favorite toy of toddlers everywhere. In addition to being fun to build up and then knock down, they also instill in your child a number of important “right brain” and “left brain” skills. Your child’s imagination will be stimulated as he brings new creations to life, and his sense of logic will grow through the trial and error of figuring out which methods of construction work and which ones don’t. 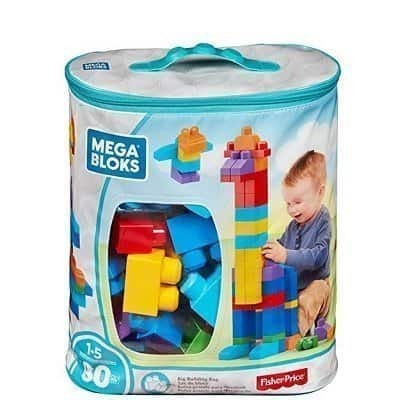 This particular set is the gold standard of building blocks. Eighty colorful blocks come in various shapes, including several base pieces to support larger constructions. The different pieces fit together securely for tantrum-free building but are still easy for little hands to take apart, teaching your child important motor skills in the process. Best yet, these blocks improve spatial awareness, which studies have found helps with children’s success in math and science later in life. Made of sturdy polypropylene plastic, they also come in a handy carrying case to make clean-up a breeze and allow for easy travel. Puzzles are an excellent way to teach your child fine motor skills and help develop his hand-eye coordination. They’re also great for teaching problem-solving, shape recognition, and patience. Melissa & Doug puzzles are well-loved by parents and kids alike, and this set of three puzzles is no different. Your child will love the colorful illustrations, and you’ll appreciate the sturdy wood construction. The three puzzles help teach letters, colors, and numbers. The pegs on top of each piece make it easy for little hands to move them around. Under each puzzle piece is a colorful picture that is revealed when the pieces are removed, making the puzzle a sort of matching game. 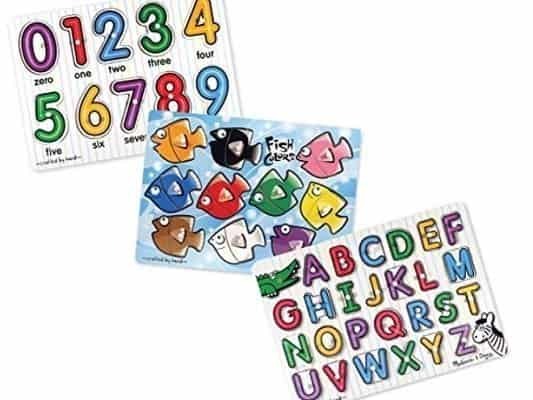 For the color puzzle, each fish is the same shape, so your child will have to rely on color matching to complete it. Under each of the number pieces is an image showing that number as a quantity of a particular item. The alphabet puzzle depicts different words starting with each letter. My son always wants to join in on the board and card games his sister plays, but he’s not yet old enough to understand how to play them. But now, finally, there is a game designed just for someone his age! 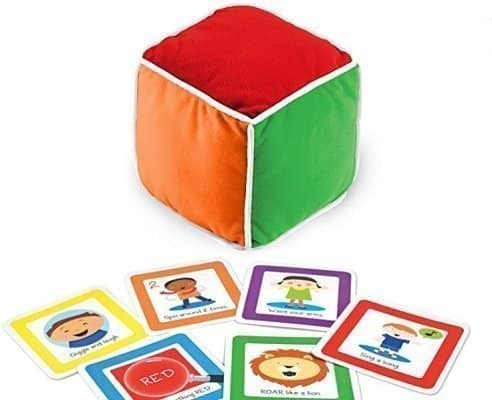 The game is played by rolling the large, plush cube and selecting a category card based on the color that lands face up. The categories include emotions, body parts, animal sounds, colors, counting, and actions. Each card requires the players to do something such as roar like a lion, find a blue object, or make a sleepy face. Your child will love the active nature of this game, as well as the bright colors and illustrations. Plus he’ll get to see Mommy or Daddy making silly faces and noises, too! Playing this game with your child will encourage family bonding as well as teach the basics of game playing, including taking turns and following instructions. Though it seems really simple, this peg board set is great for teaching several important skills, including hand-eye coordination, visual perception, and fine motor skills. The set comes with 30 colorful pegs and a 8.5″ square foam board to stick them into. The pegs stack on top of each other, allowing children to stack them in various ways. As they do so, children can develop color recognition, counting, sorting, patterning, and very basic math skills. The set even includes a downloadable activity guide full of appropriate learning activities for both toddlers and preschoolers, so you can get the most out of this gift. The pegs are large, making them easy for small hands to grasp. They also come with a drawstring bag to help with clean-up and storage. Imagination is so important for a child’s development, and two is the age when most kids begin to understand imaginative play. The following toys will help expand your child’s mind and teach him to think creatively and uniquely. Sometimes it’s the simplest toys that become our children’s favorites. This particular one, while rather basic, is guaranteed to provide hours of fun–particularly if your child loves dinosaurs and/or cars. 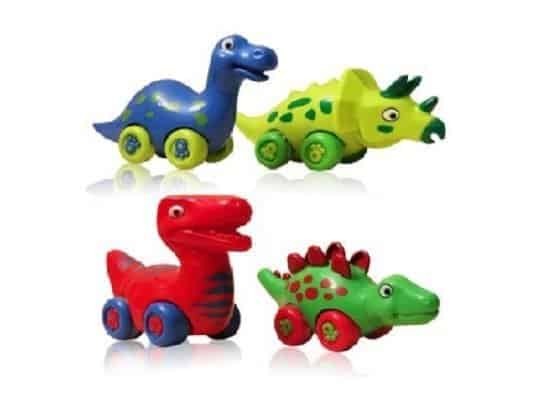 This set of four dinosaurs includes a T-Rex, a Brontosaurus, a Triceratops, and a Stegosaurus, all of which are on wheels! They are even self-propelled when you pull them back and let them go. In addition to being a good size for small hands, these little dinosaurs are very durable. As your child rolls them around and plays pretend with them, he’ll nurture his growing imagination and foster an interest not only in dinosaurs but in science in general. 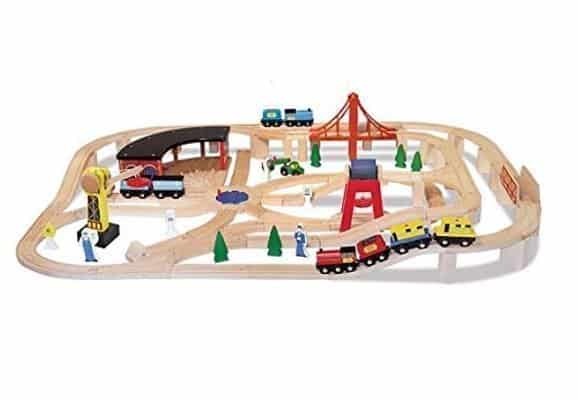 Unlike a lot of the other sets you can purchase, this one includes so much more than just the wooden track pieces. In addition to 100 track pieces, it also comes with 13 train car pieces, trees, signs, a conductor, an engineer, a suspension bridge, and more. The pieces are pretty easy to put together, though your child will likely need your help to set up more complicated tracks, such as those that are elevated. But thankfully, this set includes instructions for how to build four different configurations. So don’t worry about being creative! 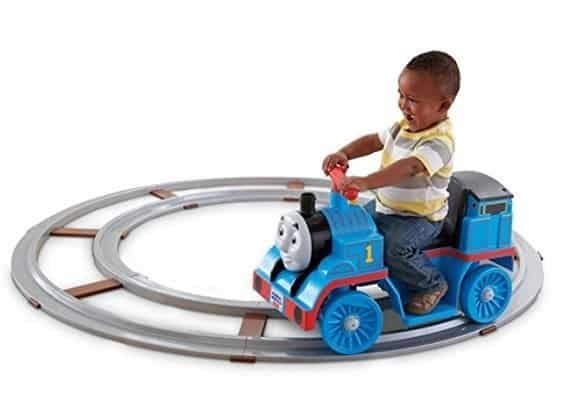 Then, once the tracks are built, your child will have endless fun pushing the trains around and, if he’s anything like my son, shouting, “All aboard!” It’s a toy that will truly grow with your child and continue to entertain him for years to come. 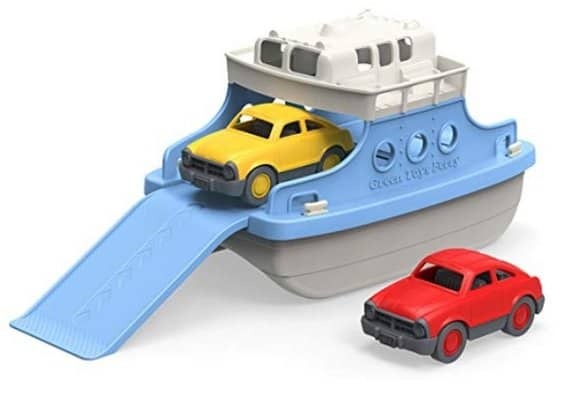 Wait a minute–a toy that includes a boat and cars and can go in the water? Where’s the bad? That’s pretty much how my son feels about this toy. It combines three of his favorite things (and, I suspect, the three favorite things of many two-year-old boys). 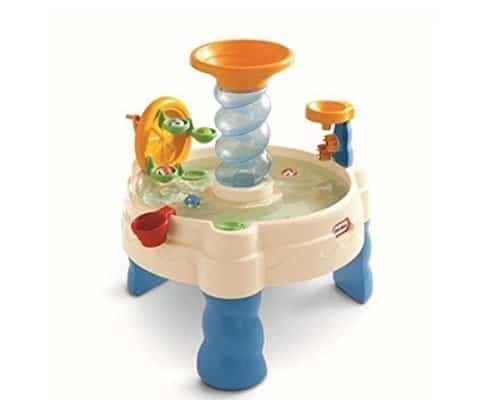 Your child can play with this toy in many ways, from driving the cars up the boat’s ramp or driving them along the bathtub wall, to shoving the boat underwater until it fills and then pouring the water out. The bubbling sound it makes when you do this is my son’s current obsession. Any hey, anything to distract your little one from splashing you is good, right? This may be the coolest ride-on toy I’ve ever seen. It’s a must-have for any Thomas or train-loving boy. Built to hold children 40 pounds or less, the train travels at 1 mile per hour on the 15-foot track or 2 miles per hour off of the track. To power it, your child has to simply hold down a button. A yellow whistle button at the front of the train allows your child to hear fun train sounds as well as phrases from Thomas himself. You can watch his confidence build as he asserts his independence through driving his own little vehicle. He’ll also learn about cause of effect, stretch his imagination through pretend play, and hone his motor skills (Hah–a pun!). With the possibility of being used indoors or outdoors, as well as with the track or without it, this toy will provide your aspiring train engineer with hours and hours of fun. I’ll never understand the joy little children get from watching a car roll down a ramp over and over again. Yet somehow, this is a favorite toddler pastime. And it makes toys like this perfect for hours of non-stop entertainment. Standing at two feet tall, this roller-coaster inspires car track features steep drops and death-defying loops for the two Little People cars that ride it. Lights and sounds make the whole experience more exciting, and an optional lift at the end of the loop send these little guys flying. There are two different tracks for the cars to go down, and each includes the thrilling loop at the end. All your child needs to do is place a car at the top push the yellow release button, and the cars will be on their way. A play tent is the ultimate in imaginative play toys. 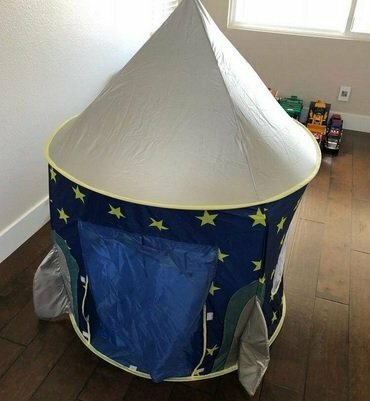 A tent can be anything your little one says it is, from a mysterious cave to a comfortable house or a super fast rocket ship. And, in fact, this one actually looks like a rocket ship! As an extra bonus, this tent comes with a light that can project 24 space-related images inside. Your child can use this tent outside or inside, and it collapses easily for hassle-free relocation between the two. To assemble it, simply unfold it; slide the sturdy, non-fiberglass poles in place; and pop it up. When you need to put it away, there’s a tote for out-of-the-way storage. This tent has mesh windows and a roll-up door, which allow for extra airflow and easier passage in and out. And at 53″ tall and 41″ wide, it’s incredibly spacious for a children’s tent. With that much room, your child will never run out of ways to play make believe.